This week I’m blogging on the most climactic event in all of history: the Resurrection of Jesus from the dead. Is it true? Did the Bible get it right? Are there other plausible alternatives? Wading through Flannery O’Conner, myth-spinning fishermen, Homer’s Iliad, legendary body-snatchers, a crucified Judas, the Battle of Waterloo, and hallucinating ghost-whisperers, I’ll seek to convince you, before Holy Week, that the Resurrection is not just a good story, but a literal, historical reality. So far we’ve looked at three of the four possible scenarios regarding Jesus’ death. In the first we questioned whether the Bible was just a myth, a legend, or a lie, which would crumble the foundation of Christianity. In the second we wondered whether Jesus even died in the first place–if he didn’t die on the Cross, then he certainly didn’t rise two days later. Then finally, assuming Jesus did die on the Cross, we explored the most popular alternative theories to the Resurrection. Which finally leaves us with the last scenario. This fourth one holds that Jesus was crucified, that he did die, and that he was buried. But that on the third day he rose again from the dead. We can arrive at this conclusion by disproving the other alternatives, as we’ve attempted to do throughout this week, but even that isn’t necessary. In fact we don’t even need the Bible to become confident that this is the true scenario. Why? Because we can prove the literal Resurrection almost entirely by looking at history. Three bits of evidence here hold sway: the Church, the Sabbath, and the transformation of Jesus’ disciples. First, the existence of the Church. Two-thousand years ago, there was no Christian Church. And then suddenly, sometime in the middle of the first-century, there was. Something had to have happened to spark this explosive movement. More than two-billion people today call themselves Christian, and they claim to ground their religion on a man who was once dead, yet now is alive. In past centuries, billions more have claimed the same thing. This isn’t a belief that existed since the beginning of time, nor one that evolved slowly through centuries. It sprang into existence almost instantaneously around the year 30 AD. How can this be explained without something miraculous happening at that time? Also, consider the Church’s longevity. What other institution in human history has lasted this long, has survived this much corruption, has time and again risen above the many forces trying to pull her down? How can we explain this resilience without some living, divine protection? A dead man can’t sustain a religion. Next, notice the sudden and well-documented shift of the Sabbath from Saturday to Sunday in the first century. In the ancient world, just as in ours, the Jews held deep reverence for the Sabbath, the God-ordained weekly day of rest. Just as God rested on the seventh day of Creation, so the Jews rested from work on the seventh day of the week. Violating this Sabbath by working was considered a severe crime and the harsh punishment was a sign of how seriously the Jews took this day. So with this much respect, honor, and devotion paid to this seventh day of the week, how can we explain the sudden shift in the mid-first century? Why would a large number of Jews arbitrarily decide to move the Sabbath to the first day of the week unless something profound, something transformative, something new happened on a Sunday? Finally, look at the incredible transformation of the apostles. After Jesus’ burial, his cringing followers huddled in a locked room, deathly afraid of the Jewish leaders. Yet just a couple days later we see them boldly upbraiding these leaders and proclaiming the Resurrection of Christ without a hint of fear or timidity. Even non-Biblical accounts describe this metamorphosis. So what changed for them? In 1815, during the Battle of Waterloo, the Duke of Wellington led the English troops in a major battle against Napoleon Bonaparte, the powerful French emperor. Since the fight took place in Belgium, the English citizens back home waited anxiously for word of the outcome. They tirelessly gazed off into the horizon, looking for signals of the battle’s result. Then one day the message came. Waving flags in the distance signaled two words: “Wellington…Defeated.” Immediately hearts sank, hope was lost, and despair settled over the crowds. England, they believed, was doomed. But then unexpectedly, a third word was signaled: “Wellington…Defeated…Enemy.” Oh, what a shift! The darkness was lifted and replaced with joyous celebration. The crowd was filled with singing, laughing, and victorious shouts. The same thing happened two thousand years ago. On Good Friday, the disciples had witnessed the death of their great hero and they thought that was the last word. But on Sunday, a new word was spoken: love had conquered evil and life had prevailed over death. Only something as astounding, surprising, and revolutionary as the Resurrection could spark this revived sense of novelty and excitement that we then see in the disciples. History shows us that ten of the eleven faithful apostles were martyred for their belief in this Resurrection. 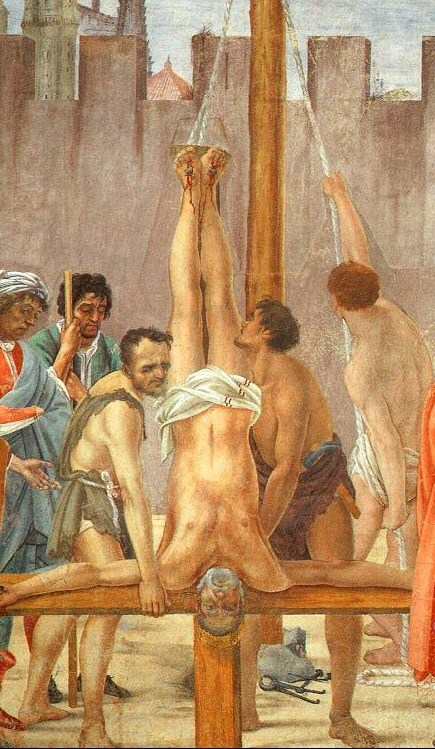 Some were beheaded, some were stoned, some were flayed alive, and one was crucified upside-down. The only one who escaped martyrdom, John, was still boiled alive for his conviction. Why were these men so willing to die for this belief? Plenty of people die for something they think is true, like plane-crashing terrorists convinced that mass murder is the will of God. But nobody dies for something they know to be untrue. When we confirm the Bible’s veracity, disprove alternatives to the Resurrection, and see in history its startling effects, we can’t help but affirm that the Resurrection happened just as it is documented: Jesus of Nazareth, who claimed to be God, died, was buried, and on the third day rose again from the dead. To finish up, read Part 7 – What the Resurrection Means which will conclude this Resurrection series. Fr. Robert Barron’s work influences pretty much everything I write or teach. So if I didn’t get something from any of the sources below, I probably got it from him. Barron, Fr. Robert – Why is our faith in the Resurrection credible?